We offer (to our local customers) instrument repairs for band instruments, orchestra instruments, and fretted instruments (such as dent work, chem cleanings, key alignments & adjustments, pad and cork replacements and seatings, bridge fittings, soundpost settings, polishing/oiling/lubricating, bow rehairings, and much more)! We also restring guitars (electric, acoustic, and bass), ukuleles, mandolins, violins, violas, cellos, and upright basses for a nominal fee. The clarinet pictured (above left) was a wood Martin Frères clarinet from the 1950's. 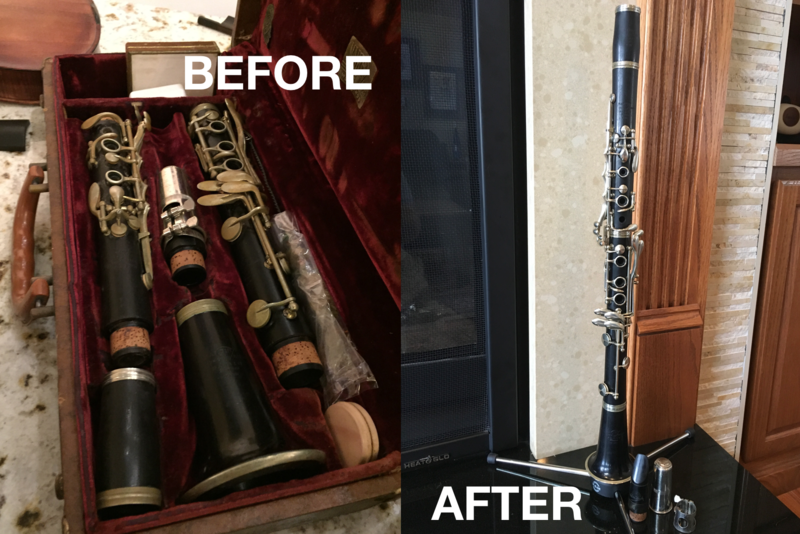 The clarinet was thoroughly cleaned and the mouthpiece and barrel were sanitized, the silver keywork was removed and polished, the pads and corks were replaced, the bore was oiled, the keys were aligned and adjusted. 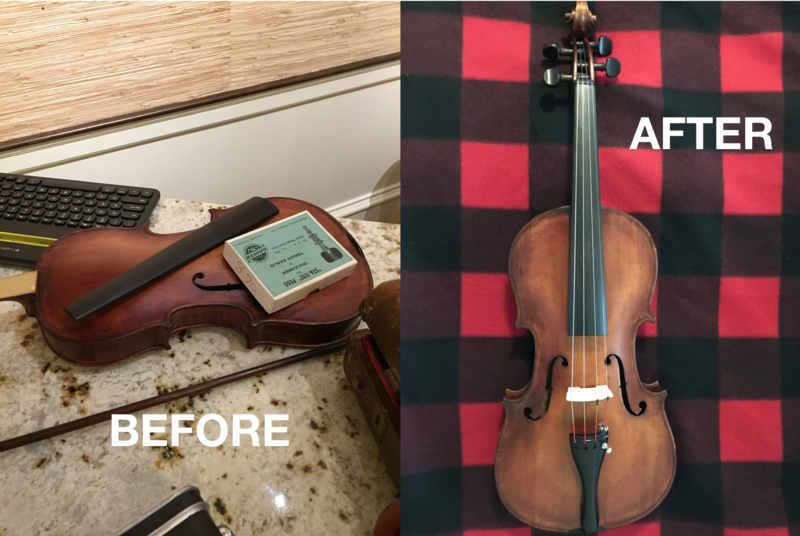 The violin pictured (above) came to us in pieces. The tape was removed from the neck and the fingerboard was properly fitted and reattached. A new bridge was cut and fitted, a new soundpost was set, a new nut was cut and fitted. Two hairline cracks to the violin top were repaired. The pegs provided were for a different violin, so new pegs were shaped, cut, and drilled. A new tailpiece was installed and fresh strings put on. These two instruments were brought back to life for a new generation of musicians to enjoy!